It is painful for some people to attempt and reach behind their backs. Reaching outward and upward can be painful and some feel a lack of strength when attempting to lift objects. The pain may also be associated with degeneration or inflammation of the Rotator cuff tendons leading to Rotator Cuff Tendinitis and what is called 'Shoulder Impingement Syndrome', which is caused by repetitive arm movements or long periods with the arm in the one position such as prolonged mouse and keyboard use on computers that irritates and inflames the shoulder bursa. The Bursa are the lubricated bag-like tissues that act to minimize friction and help protect the muscles and tendons when they move against each other. The aim of this article is to explain these common causes of shoulder pain and home remedies and exercises that can be used to treat them. The rotator cuff can be injured with a fall onto the arm or by jerking a load over head, or when the arm is pulled downward. 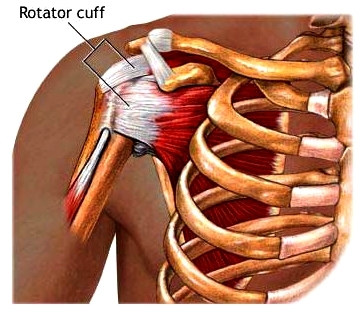 Injuries to the rotator cuff can cause a tear that may require surgical treatment as they don't heal readily. 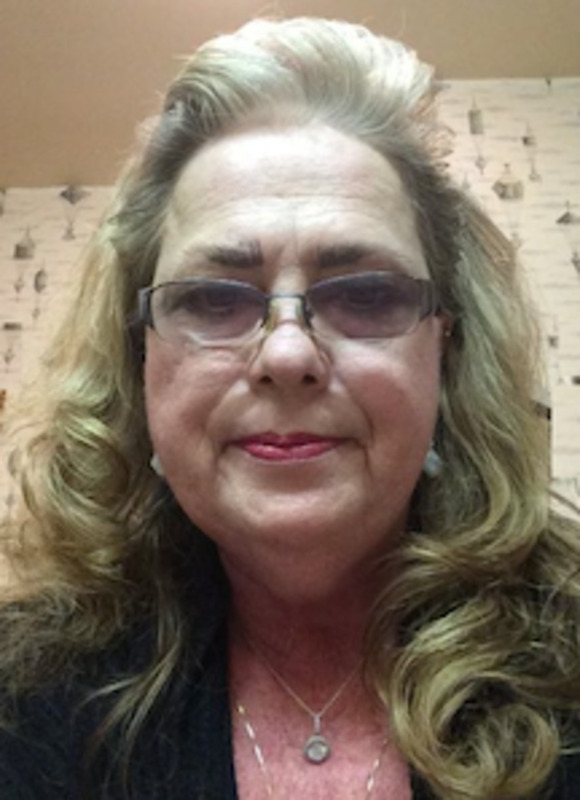 People at risk for this affliction include athletes involved in throwing and racket sports such as tennis players, baseball pitchers, swimmers as well as people who use their computers for long periods who repetitively reach forward to move their mouse or to type on their keyboard. People who have poor posture when at the computer (such sitting with rounded shoulders or lower arms not parallel with the desk, and who don't support their wrists may pinch one or more of the tendons in the shoulder region) run the risk of developing these problems especially in old age. Anyone who reaches over head frequently and regularly can develop this problem. This includes swimmers, waiters, window cleaners, painters. With rest, change in posture, stretching and exercises, the symptoms often improve or go away in many people that have mild problems. However, this may take weeks or months to occur. 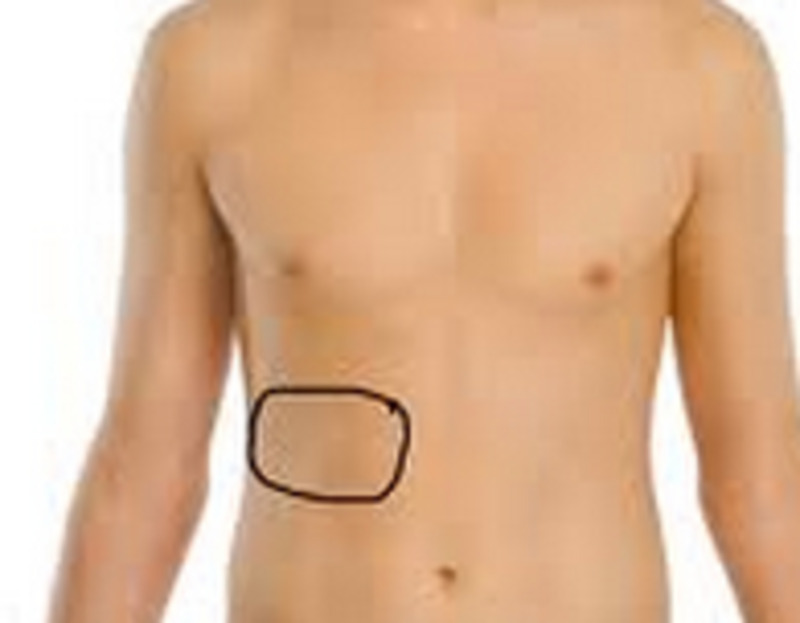 There are a range of stretching and exercises for the shoulder and scapular that provide help for many people. 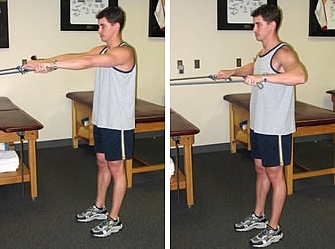 The Pendulum Stretch - This exercise gently stretches the tendon area and relieves pressure on the tendons. It can be done at home or work to relieve strain. Gently bend over with your arm hanging vertically. Start the stretching with the arm only for the first few days, then use weights of 1 to 2 lb (0.5 to 1 kg) each week and gradually expand the diameter of the movement circle. You can use a bottle of water. 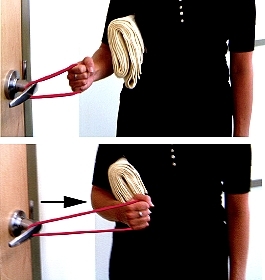 Swing your arm back and forth or in a small circle (no greater than 12 in (30 cm) in diameter). The exercise may cause mild pain or strain but this is OK if not severe. 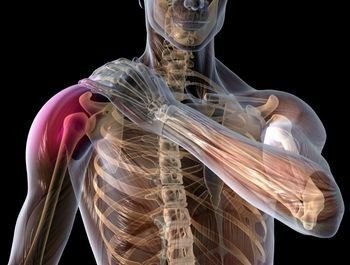 Muscle Strengthening Exercises - These exercises improve shoulder muscle strength, relieve pain when done gently, and help to prevent further injury or problems. The level of resistance or weight size can be increased gradually. Some Mild soreness is OK with these exercises, but stop them if sharp or severe pain occurs. Perform 15 to 20 repetitions of each exercise described fairly slowly to avoid strain and jerking, holding for one to two seconds at full extension for each exercise. You can use hand weights or resistance bands for these exercises. Inward Rotation Exercise - This is similar with the band attached to a door handle or something similar. 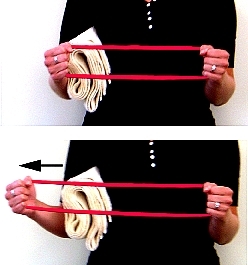 Arm Lifting Lxercise - Using both arms, bend your arms at the elbow with the resistance band near each elbows and extend your arms out 4-5 inches ( 3 cm) away from your body, holding for about 5 seconds. 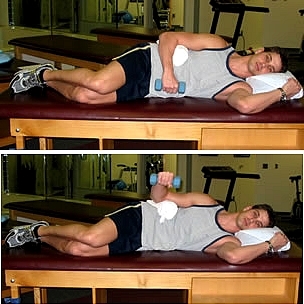 External Rotation in Prone Position - Lie on side with your elbow resting on stomach. 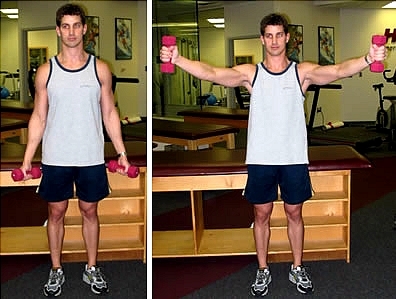 Slowly rotate arm upwards until your lower arm is just above horizontal. This exercise can be initiated using a 2-3 pound dumbbell. Horizontal Abduction in Prone Position - Lie on stomach with your arm hanging down vertically with your thumb facing forward. Slowly lift your arm up to the horizontal position side ( not higher as it will cause strain). Prone Forward Elevation in Prone Position - Lie on stomach with your arm hanging down vertically, but with your thumb facing forward. Slowly raise arm in a forward sweep to an angle of about 45 degrees (don't go any higher). 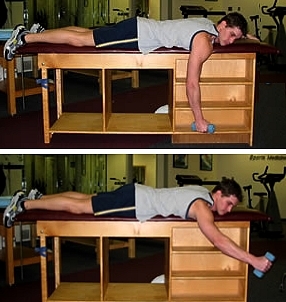 Prone Rowing Action - Begin in the same setup as before but with your thumb is facing towards the body. 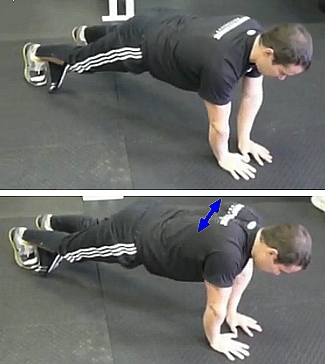 Perform a rowing action with the elbow level with the shoulder as shown. 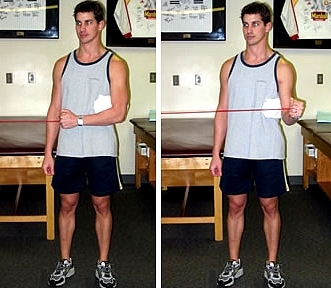 External Rotation with Resistance Band - Take a position holding the band across your abdomen, with a rolled towel under your arm. Slowly rotate arm horizontally until it is pointing forward, and hold for 3 seconds. 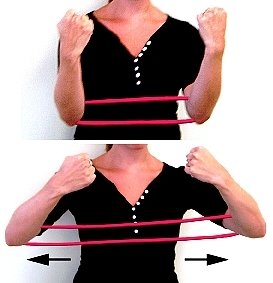 Horizontal Abduction with Resistance Band - Face the attachment pint for the band, with hands holding the handles extended forwards. Slowly pull both arm backwards and out to the side. Keep your arms at shoulder height. As you do this exercise, pull your shoulder blade backwards and inwards at the same time. 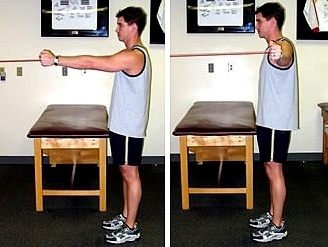 Rowing with a Resistance Band - Using the same set up as before, but this time with the hands held horizontal. Start a rowing motion as shown. Thanks for the article. I just started working doing cleaning at my gym and I'm determined to take a preventative approach to the pain I'm associating with the new routine. I was familiar with some of the exercises from my workout and it's good to know that I'll be continuing to condition as well as strengthen my shoulders. Your article is very informative and I look forward to implementing your exercises. Great advice. Just what I am looking for until I can get to see a physio. 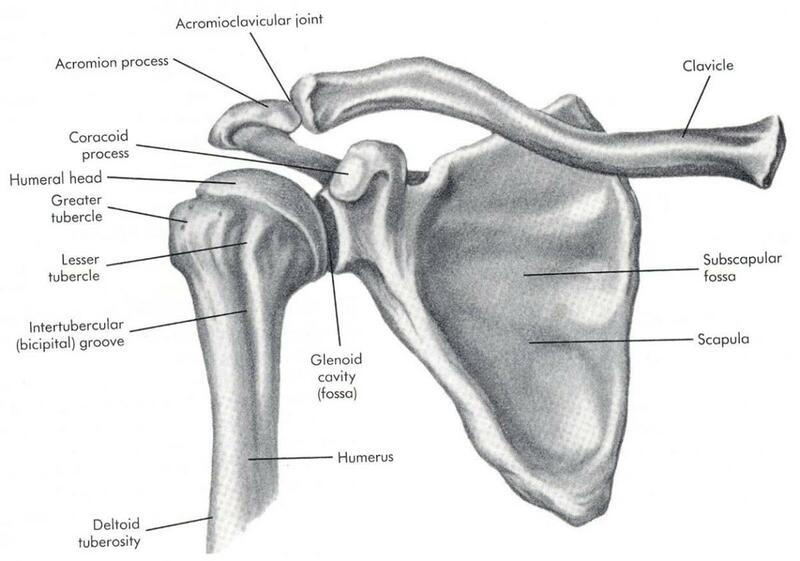 Most common injury in the Marines when I was serving was torn rotator cuff. It's very neglected in many workouts, and a very common injury, About as common as a headache, haha.I am so glad I discovered your hub. I just started having trouble with my shoulder and was wondering what to do to help alleviate the pain. These are all wonderful exercises for strengthening the muscles in the shoulder area. I'm going to try some of your suggestions, especially the one for stretching. I am so glad I discovered your hub. I just started having trouble with my shoulder and was wondering what to do to help alleviate the pain. 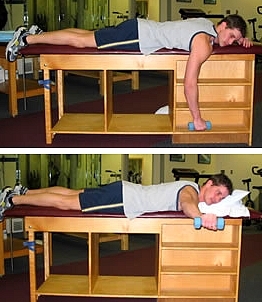 These are all wonderful exercises for strengthening the muscles in the shoulder area. I'm going to try some of your suggestions, especially the one for stretching. Most common injury in the Marines when I was serving was torn rotator cuff. It's very neglected in many workouts, and a very common injury, About as common as a headache, haha. Informative, useful and professionally put together - I now know what I am suffering from and what to do about it! i have written rotator cuff rehabilitation plans for my clients but nothing has good as your hub. congratulations, it really is amazing, and i will start forwarding it to my clients. Really useful Hub for the people suffering from shoulder pain. These days it has become a serious health problem. 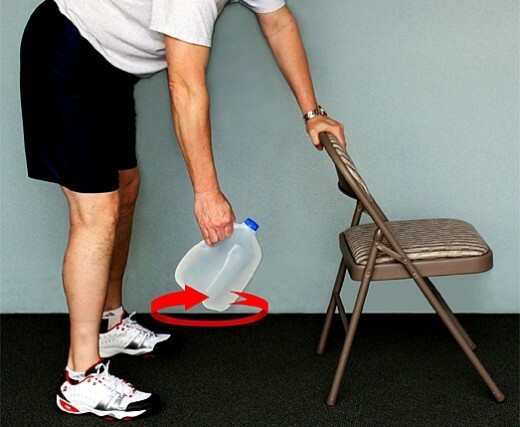 Thanks for adding easy methods to get rid of shoulder pain. I like pendulum method and it seems very simple and easy to follow. You have also added nice photos. Thanks again for this wonderful Hub! Thumbs Up! Great post. 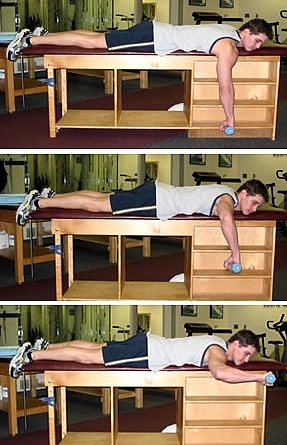 I have had shoulder issues in the past and these exercises are great for rehab! 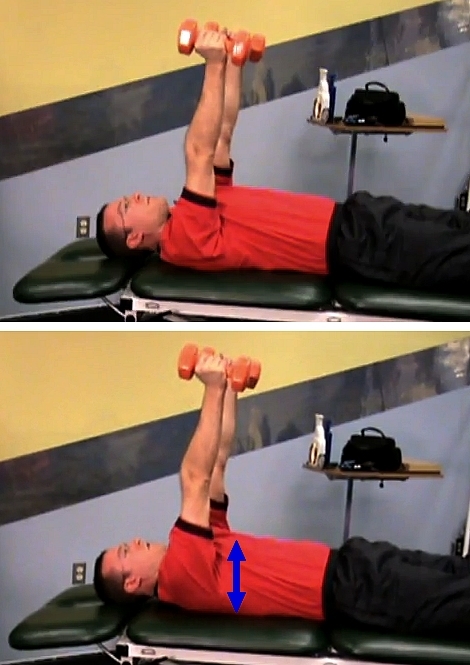 Good tips and exercises on ways to help & prevent shoulder pain. Internal & external rotations have really helped me.